Spoon bread is so-called because it’s supposed to be so soft that you can’t cut it with a knife as you do corn bread, explains LC recipe tester and Southern food aficionado Karen Depp, who likens the consistency to that of a soft pudding as opposed to a sturdy corn bread. Ms. Lewis liked to serve this simple, creamy, satiating pudding of sorts for supper alongside whole scallions sweated in butter over a low flame in a covered pan. We won’t object to that. Nor will we object to serving this spoon bread at breakfast with eggs sunny-side up along with those scallions…or perhaps country ham and a generous drizzle of maple syrup…or, well, you tell us. 1. Preheat the oven to 400°F (204° C). 2. Sift the cornmeal, salt, sugar, baking soda, and baking powder into a large bowl and combine. Make a well in the center. Dump the beaten eggs into the well but do not incorporate them yet. 5. Now carefully remove the hot dish from the oven and tilt it around to slick the entire surface with butter. Tip any excess butter from the dish into the batter and stir quickly to incorporate, then pour the batter into the hot baking dish. 6. Bake the spoon bread for 35 minutes. Spoon it hot from the dish with loads of fresh butter on the side. Spoon bread isn’t as well-known as cornbread outside the South, and that’s a shame—it would appeal to many non-Southerners who find traditional cornbread unappealing. Spoon bread is eggy, rich, and soft, and you scoop it right out of the pan with a spoon. This recipe from Edna Lewis is spot-on. Follow it as written, and you’ll have a perfect example of the Southern specialty. You may think that with the quantity of buttermilk called for, the end result would taste tangy, but it doesn’t—it actually has a surprising sweetness to it. While it’s intended as a side dish at the dinner table, I have to admit that I ate the leftovers for breakfast, with fruit and a drizzle of syrup. Delicious. I really enjoyed this dish. I can’t compare it to other spoon breads as this is the first one I’ve had, but I loved the soufflé-like quality and the ease with which this came together. I went with the suggested buttermilk (low-fat), and I recommend this instead of plain milk, as there was an extra dimension that the tanginess brought to the sweetness of the cornmeal and the richness of the eggs and butter. I had to bake this for 5 minutes longer than suggested. The spoon bread paired well with a mixed green salad and sausage. I’m tempted to throw in some sharp cheddar the next time I make this! Lawd, I love this recipe, and bless Edna Lewis for sharing it. I like to use finely milled white cornmeal along with the best buttermilk for an airy, light, and spoon-tender “soufflé.” A dribble of melted butter is good, but a slight drizzle of maple syrup takes it to a new level. Be sure that you don’t overheat your baking dish—you want it just hot enough to melt the butter—otherwise the spoon bread might separate into layers. 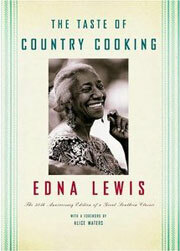 Spoon Bread Recipe © 2006 Edna Lewis. Photo © 2006 Beth Price. All rights reserved. All recipes and photos used with permission of the publisher. Can millet be used in place of cornmeal?? Hi Ritu, I’ve made this spoonbread many times and the cornmeal gives it such a light texture. Although millet can be used for spoonbread, the proportion of liquids is different, as is the cook time. I would be reluctant to use it as a straight substitute for cornmeal in this recipe. Can 2% milk be used instead of buttermilk in this recipe? Nia, I think it would work just fine. I was actually looking at this recipe the other day and considering it for Thanksgiving dinner and wondering the same as you (save for the fact that I’d use whole milk for a creamier, richer texture). The only difference I expect to see is that the spoon bread won’t have that slight tang, and if you’re like me, that’s absolutely fine. Perhaps start with just a little less than the full amount of milk that the recipe requires, then add the rest as needed to get the specified consistency, seeing as buttermilk tends to be thicker than 2%. And kindly let us know how it goes…. I just made the recipe following the directions exactly, except for the use of yellow cornmeal instead of white, but I don’t believe that was the issue. My result was a beautiful two layer creation. Corn bread on the bottom, light egg mixture on the top. Unfortunately not what I was hoping for. I’ve made spoon bread in the past, separating the eggs and folding in whipped egg whites, but I was hoping for a simpler option. Obviously I did something wrong that caused the batter to separate into two layers. Could any of you experienced/trained souffle cooks tell me where I made my error? Hi Roux-fus, I admit it, I’m a bit baffled. I usually make this using a very fine white cornmeal so I’m wondering if your cornmeal may be the culprit. I’ve asked our testers to see if any of them may have experienced the same issue. Roux-fus, Beth queried our recipe testers, and no one has experienced this. Cooking instructor Cindi Kruth said she’d her guess is that the ingredients weren’t blended quite thoroughly enough and the eggs puffed up the top while the heavier ingredients sank. The techinique is a bit unusual, as most spoonbreads are made rather like souffles with the eggs separated and the whites beaten stiff then folded in, as you noted. I know the instinct with delicate batters is to not overmix, although in this case perhaps a little more arm power is needed than usual. We’ll let you know if we hear from anyone else, and kindly let us know if you give it anther go. Renee Schettler Rossi, I traditionally use yellow corn meal for spoon bread, so I don’t think it makes a difference. Mine always soufflés. I think it wasn’t mixed well for Roux-fus. This is a great recipe, however. I’ve made it the other way, separating the eggs and and beating the whites stiffly and folding in. Joan, I agree, I can’t imagine that the type of cornmeal makes a difference. 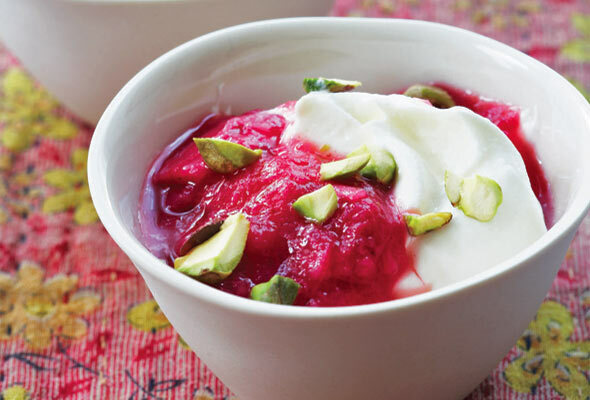 We’ve actually made this very recipe a gazillion times without this happening, and so it does seem it was not mixed quite enough, an understandable oops seeing that so many recipes for delicate baked goods caution against over mixing. Appreciate you chiming in! Of interesting note, according to the Picayune’s Creole Cookbook, only white cornmeal was used in recipes — yellow cornmeal was used for animal feed. Of course, this was published in 1912, and is a compilation of one of New Orleans’ daily papers recipes. I’ve always been intrigued as to when the switch was made, and why we see so many cornbreads and spoon-breads made with yellow cornmeal. Ironically, even though New Orleans is a southern city, I don’t know of a place that serves spoonbread nor do I know anyone who has actually made it. Although, I have heard of it and will give it a try! Hi John, you definitely need to give it a try. This is one of my favorite recipes and I do use finely ground white cornmeal. I feel like it gives a lighter, somewhat finer taste than yellow. I too had this separate into 2 layers. Other spoon bread recipes make a mush with the cornmeal, BEFORE incorporating the eggs and leavening. I tried this recipe, because by eliminating that step there are fewer dishes to wash. Apparently one NEEDS the precooking step. An egg custard on top of a dense cornmeal bread is not my idea of spoonbread. I’d recommend a different recipe! Hi J.C., I’m so sorry that you had separation issues. 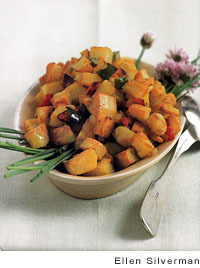 I’ve made this recipe numerous times and it has always worked perfectly. What kind of baking dish did you use? And how long did you preheat it in the oven with the butter? Sometimes if the pan is too hot, the layers will separate. I also use a very finely milled white corn meal. I had exactly the same problem, J.C, and I followed the directions to a T. I had commented here earlier with the same problem, but my comment has been taken down. I really want to make spoonbread, because I have never made it and it sounds so good in my taste imagination, but I don’t think this is the recipe for me. Hi Christina, I didn’t post your comment as we communicated via email about your issues. I apologize profusely for any confusion. As I stated in our most recent email, I really would love to figure out why this recipe is not working for you. The photo on the site was taken just last week and shows the soufflé like consistency. I used finely milled white corn meal, a ceramic baking dish and heated the butter until it just began to melt. This happened to me the first time only because my KitchenAid doesnt quite reach the bottom of the bowl..kids were screaming…I was in a rush…didnt think about it. Since then I’ve used a hand mixer and made sure everything was completely mixed and it’s never happened again! Mitch, many thanks for confirming our suspicions about this being an issue with the mixing. We so appreciate it. Marvie to hear that switching to a hand mixer made all the difference! If it has Edna Lewis’ name on it, I am game. She was a national treasure. Thank you for this recipe. It worked great for me other than the consistency seemed a bit too dense/solid. Maybe I should try cooking it a shorter amount. It wasn’t as runny in the center as I remember the spoon bread of my childhood being… FWIW, I didn’t have buttermilk, so I faked it with 1% milk and 2TBS of lemon juice that sat for 5mins. before incorporating. Hi Jess, I’ve made this numerous times and the center tends to be more firm then runny. Do you still have the recipe from your childhood? It would be fun to compare. The “recipe” from my childhood was a box of Jiffy Spoon Bread Mix (which they don’t sell anymore). I don’t remember how it was made other than that it was very simple. Possibly just add milk/water and eggs, stir together and bake… Not sure why they don’t sell it anymore, it was great and very easy to make. Hmm, there is a recipe on the Jiffy site for spoon bread that uses creamed corn. That would give the spoon bread a different consistency. Yeah, that is not the same, that uses their corn muffin mix and adds to it, in the past they had a box mix that was specifically spoon bread and you added very little to it. It had a soufle like texture and looked a lot like the photo with this article when cooked. Well, darn, I would give this recipe another go. That is the actual picture of the spoon bread that I made. You might want to check your oven temperature and make sure it’s calibrated properly. It might be running a tad too high? 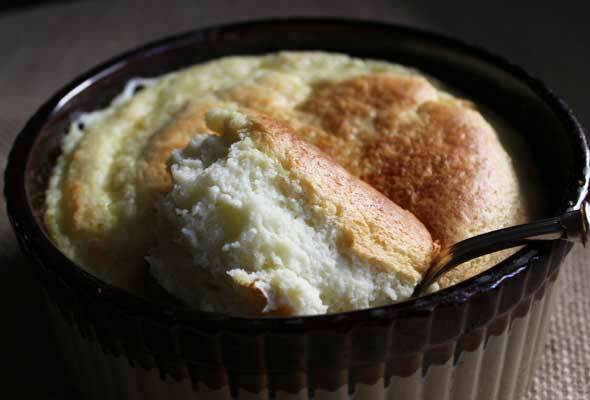 Colonial Williamsburg sells a spoonbread mix that turns out very souffle-like. They don’t always have it so I’ve been making mine from scratch and trying different things. Let us know, Jess. Fingers crossed! I grew up making and eating spoonbread in VA and hadn’t made it in years. The past 5 times I’ve made it using the old recipe we had written down in the family (nearly identical), it has separated. I even had my mother watch me make it last time I was in VA, and it turned out perfect like hers always did, but continues to separate when I cook it at home. Did anyone ever find out a solution to why this was happening? Tommy, take a look at Renee’s and Beth’s replies to Roux-fus above. Just took this out of the oven. Best I’ve made or eaten! I like that you don’t have to cook the cornmeal with water/milk. It has just the right amount of everything. The texture was perfect! So happy I found this recipe. Thank you. Love that you appreciate the texture of this spoon bread like we do, Sandy! We so appreciate you taking the time to let us know. Thank you! A friend turned me on to Edna Lewis in the late 1970s, and her books taught me American cooking at a very elemental, seasonal level. I made her spoon bread a number of times back then and found that the extra step of lightly beating the whites separately and folding them into the batter gave a much more reliable result. I also remember it being spectacular with roast duck for dinner and leftover the next morning with eggs fried in duck fat. Philip, I suspect you and I are kindred souls. Love to hear that you appreciate the beauty and soul in Edna’s prose and recipes. Appreciate you sharing your technique, that makes perfect sense. And what isn’t spectacular with anything fried in duck fat? !